Marty Wilde, MBE (born Reginald Leonard Smith; 15 April 1939)  is an English singer and songwriter. He was among the first generation of British pop stars to emulate American rock and roll, and is the father of pop singers Ricky, Kim and Roxanne Wilde. Blackheath is a district of south east London, England, within the Royal Borough of Greenwich and the London Borough of Lewisham. It is located east of Lewisham, and south of Greenwich. Blackheath is within the historic boundaries of Kent. Tommy Steele, is an English entertainer, regarded as Britain's first teen idol and rock and roll star. He reached number one with "Singing the Blues" in 1957, and The Tommy Steele Story was the first album by a UK act to reach number one. 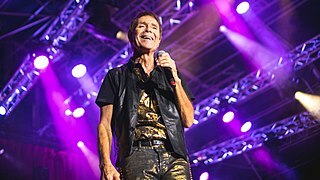 Sir Cliff Richard, is a British pop singer, musician, performer, actor and philanthropist. Richard has sold more than 250 million records worldwide. He has total sales of over 21 million singles in the United Kingdom and is the third-top-selling artist in UK Singles Chart history, behind the Beatles and Elvis Presley. James George Tomkins, known professionally as Big Jim Sullivan, was an English musician whose career started in 1958. Ronnie Scott was a British pop music promoter, group manager and songwriter; known primarily for hit songs co-written with Marty Wilde in the 1960s, and Steve Wolfe in the 1970s. His notable UK singles are listed below, with their peak positions in the UK Singles Chart  and, for cover versions, the song's original artist given in a further set of brackets. Joseph Roger "Joe" Brown, MBE is an English entertainer. He has worked as a rock and roll singer and guitarist for more than five decades. He was a stage and television performer in the late 1950s and a UK recording star in the early 1960s. He has made six films, presented specialist radio series for BBC Radio 2, appeared on the West End stage alongside Dame Anna Neagle and has written an autobiography. In recent years he has again concentrated on recording and performing music, playing two tours of around 100 shows every year and releasing an album almost every year. Mickie Most was an English record producer, with a string of hit singles with acts such as the Animals, Herman's Hermits, the Nashville Teens, Donovan, Lulu, Suzi Quatro, Hot Chocolate, Arrows, Racey, and the Jeff Beck Group, often issued on his own RAK Records label. Ronald Wycherley, better known by his stage name Billy Fury, was an English singer from the late 1950s to the mid 1960s, and remained an active songwriter until the 1980s. Rheumatic fever, which he first contracted as a child, damaged his heart and ultimately contributed to his death. An early British rock and roll star, he equalled the Beatles' record of 24 hits in the 1960s, and spent 332 weeks on the UK chart, without a chart-topping single or album. Mike Berry is an English singer and actor. He is known for his top ten hits "Don't You Think It's Time" (1963) and "The Sunshine of Your Smile" (1980) in a singing career spanning nearly 60 years. He subsequently became an actor in the 1970s, best known for his appearances as Mr. Spooner on the British sitcom Are You Being Served? The Vernons Girls were an English musical ensemble of female vocalists. They were formed at the Vernons football pools company in the 1950s in Liverpool, settling down to a sixteen strong choir and recording an album of standards. Clemente Anselmo Arturo Cattini is an English rock and roll drummer, who was a member of the Tornados before becoming well known for his work as a session musician. He is one of the most prolific drummers in UK recording history, appearing on hundreds of recordings by artists as diverse as Cliff Richard and Lou Reed, and has featured on 42 different UK number one singles. Richard Graham Sarstedt, known by the stage name Eden Kane, is an English pop/rock singer, record producer and actor best known as a former teen idol in the 1960s. He has also recorded under his birth name and with backing group the Downbeats. Born in India, he is the elder brother of musicians Peter Sarstedt and Robin Sarstedt, with whom he has collaborated on numerous Sarstedt Brothers albums. He had success in the early 1960s as a pop star appealing to a teenage audience, with hits including "Well I Ask You" which was a UK No. 1 hit in 1961, then spent time in Australia before moving to the United States, where he began an acting career. Geoff Goddard was an English songwriter, singer and instrumentalist. 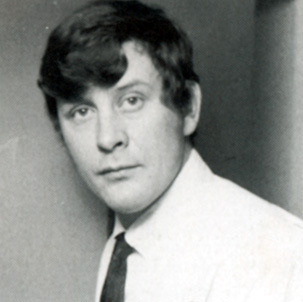 Working for Joe Meek in the early 1960s, he wrote songs for Heinz, Mike Berry, Gerry Temple, The Tornados, Kenny Hollywood, The Outlaws, Freddie Starr, Screaming Lord Sutch, The Ramblers and John Leyton. His song for Leyton, "Johnny Remember Me", reached number 1 in the UK Singles Chart. Dickie Pride, born Richard Charles Kneller, was a British rock and roll singer. He was one of Larry Parnes' stable of pop music stars, who did not enjoy as successful a career as most of his contemporaries. Vince Eager is an English pop singer. He was widely promoted by impresario Larry Parnes, but later quarrelled with him over his commercialising of Eddie Cochran's tragic early death. Eager has since appeared in cabaret and on the West End stage. Colin Hicks & The Cabin Boys were a British rock and roll band, led by Colin Hicks, the younger brother of singer Tommy Steele. Cherry Wainer was a South African-born musician, best known as a member of Lord Rockingham's XI and a soloist on the Hammond organ. "I Can't Help It " is a song written and originally recorded by Hank Williams on MGM Records. It hit number two on the Billboard country singles chart in 1951. ↑ "Martywilde.com". Martywilde.com. Archived from the original on 14 July 2011. Retrieved 16 July 2011. 1 2 3 4 5 6 7 8 Bruce Eder. "Marty Wilde | Biography". AllMusic. Retrieved 27 January 2014. ↑ "The Solid Gold Rock n Roll Show 2017 Tickets - Tour Dates & Tickets - ATG Tickets". Atgtickets.com. Retrieved 10 November 2017. ↑ "Wilde Life Encyclopedia biographies". Wilde-life.com. Retrieved 16 July 2011. ↑ Roberts, David (2006). British Hit Singles & Albums (19th ed.). London: Guinness World Records Limited. p. 602. ISBN 1-904994-10-5. ↑ "Abergavenny - Record Details". 45cat. Retrieved 19 July 2016. ↑ "1968 Charts Index". Go-Set, The Teens & Twenties Newspaper. Retrieved 20 July 2016. ↑ "Hits of the World: Australia" (PDF). Billboard. 21 September 1968. p. 49. Retrieved 28 October 2016. ↑ "Hits of the World: Belgium" (PDF). Billboard. 28 September 1968. p. 72. Retrieved 28 October 2016. ↑ "Marty Wilde | Discography". AllMusic. Retrieved 27 January 2014.